What is Chase Blueprint?What is Chase Blueprint? Home › Credit Cards Blog › What is Chase Blueprint? Credit cards, by design, make it easy for consumers to not pay off their entire balance each month. Of course, we’ve all heard the importance of paying that balance each month and the repercussions anytime we don’t. Interest is tacked on and our balances rise. We’ve been told – some of us since childhood – the importance of proper money management. Too many times, though, those warnings give way to the unpredictability of life. The grace periods come and go and we’re left with balance and hopes we can pay it in full the next month. Some credit card networks do their parts to provide tools to help their card users better manage their finances. For JPMorgan Chase, it’s answer is Blueprint. When consumers first delve into the Blueprint program, they quickly see the many benefits that can save a considerable amount of money each month. It’s the freedom to designate how the account is paid and puts the cardholder in complete control of his finances. Remember, these are just a few of the credit cards that come with Blueprint. There are many other credit cards in the Chase family, each with their own perks and benefits. 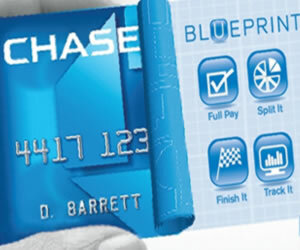 Chase Blueprint is available on many of its credit cards. Its purpose is to help consumers better manage debt and specifically, the interest rates on credit cards. There are a lot of great features associated with Chase Blueprint, but too many folks are unsure of what it is and how it can help them with their finances. In short, it allows card users to carry balances on some of their purchases, but also keeps an interest free grace period on other purposes. It’s all about lowering the risk and overwhelming interest charges some of our purchases result in. Here’s how it works. The most attractive aspect of Blueprint is the versatility it offers. Chase credit card users allows flexibility in that they can make payments on specific parts of their balance with no interest. You spent $2,000 the first week of August for school clothes for your little ones. On September 1st, your received your Chase credit card statement. Traditionally, you’d need to pay the entire $2,000 balance before your grace period expired, let’s say, the 25th of September. Unfortunately, you can only pay $1,500. Now here’s where the benefits to you come in: Under traditional credit card agreements, your interest would be figured on the entire $2,000 charge. Not only that, but the interest is applied from the date of the purchase up until the day your grace period expired, the 25th of September. And the cycle continues. For those consumers with Chase Blueprint, the option exists that allows you apply your $1,500 payment to that initial $2,000 purchase. That means you’re going to pay interest only on the $500 balance. You’ll still have to face the retroactive calculations (from the date of the purchase), but it’s based on a $500 balance instead of a $2,000 balance. Impressive, right? Here’s what we’re always impressed with each time we review the Chase family of credit cards: You don’t have to make time consuming phone calls or go through some convoluted process, either. You simply log into your online account and you’ll see each purchase that you’ve made within a specified amount of time. Click the check boxes next to those purchases you want your payment applied to and Chase credits your payment per your specifications. It’s all about giving you control of how you define your priorities. Also, let’s say you bought new appliances for your kitchen. And let’s say you spent $6,000 on those appliances. You can use the Chase Split Pay option to break up your payment plan. All you have to do with that is set it up so that your next three or four or ten (or any other number) payments include your specified dollar amount go to that $6,000 balance. It’s like a payment plan on your terms – and one that saves you a significant amount of money each year. The best part is this Chase feature is free and is part of every Chase Slate, Chase Freedom, Chase Sapphire and Chase Ink credit cards. The Chase Freedom MasterCard is still one of the most popular Chase credit cards. You earn $100 bonus cash back after your first $500 in purchases during the initial 90 days. You’ll also enjoy an intro 0% APR for the first 15 months – and that’s applicable to both purchases and balance transfers. Another popular feature of this credit card is the rotating categories; for instance, you’ll earn 5% cash back – up to $1500 – for all gas purchases and restaurant outings between July 1 and September 30. After that, the bonus categories rotate. An unlimited 1% cash back applies to all of your other purchases and up to 10% cash back when you shop online through the Chase online mall. Finally, there are no annual fees and your rewards points never expire. And, of course, you can easily incorporate Chase Blueprint into your Chase Freedom MasterCard. There’s not much Chase didn’t think of to include in this credit card offer. We also like this Chase product. It differs slightly from its Freedom counterpart, but it has a lot of great features, as well. Chase Sapphire card holders earn 40,000 bonus points after spending $3,000 during the first three months. This equates to $500 that can be used towards travel. You’ll earn double points for every dollar spent on travel and restaurants as well as one point for every dollar spent on everything else. For those who travel, this is a fine choice as you’ll enjoy discounts on airfare hotels, car rentals and even cruises so long as you redeem your points through the Chase Ultimate Rewards. No worries about foreign transaction fees, either. Enjoy direct access to the Chase customer service team around the clock and no worries about fraud, either. If your card is lost or stolen or if it’s used fraudulently, you’re not held responsible for the losses. There is a $95 annual fee; however, it’s waived during your first year.